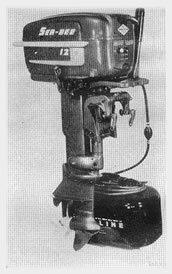 he 1957 line of Sea-Bee outboard motors, available through Goodyear Tire and Rubber Co., will feature quiet power and ease of operation. These power plants will cover the range from three hp. with automatic rewind starter to a 25 hp. unit having electric starting. Motors rated at 5, 12 and 25 hp. have forward, neutral, reverse shifts and can be fitted with remote controls. The 12 and 25 hp. sizes are offered with six-gal. remote fuel tanks. Manufacturer: Goodyear Tire and Rubber Co., 1144 E. Market St., Akron, O.